Before you head out into the parks, check here for the most up-to-date information on winter sport availability, road closures, construction projects and more. Oak Glen Nature Preserve is currently closed. The Winton Woods Boathouse is open for pedal boat rentals only until the front dock water levels recede and flood cleanup has been finished. The Winton Woods Boathouse is closed today due to flooding. The Shaker Trace Inner & Outer Loops are closed at Mt. Hope Road, New Haven Road and Willey Road due to high water. Detours are marked. Sharon Woods Boathouse is closed today due to weather. 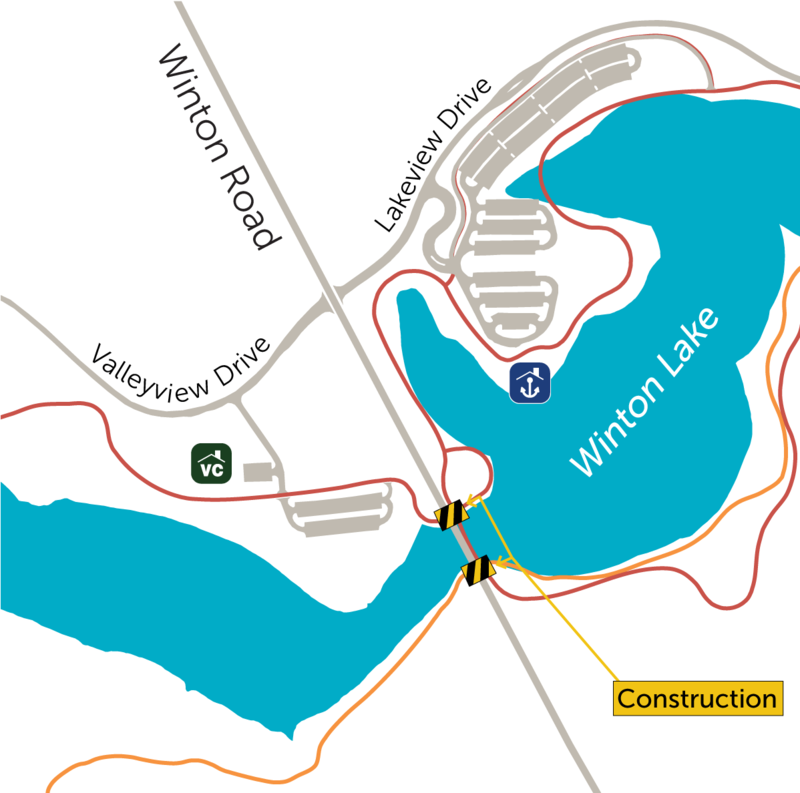 Sections of the Harbor Trail and Horse Trail will be closed during construction on the Winton Road bridge. The Wooded Horse Trails at Miami Whitewater Forest are closed. The Little Miami Golf Center's regulation golf course is closed Saturday and Sunday due to flooding. The par 3 and driving range are open. Athletic Fields: Visit our Athletics page for rain-out numbers for leagues at Miami Whitewater Forest, Triple Creek and Francis RecreAcres. Boathouses: Open. For hours, click here. Canoe, kayak and paddleboard rentals will begin on April 15, 2019. The Winton Queen tour boat will be closed until further notice for repairs and upgrades. Harbor Snack Bars: Open May 4-September 2, 2019. For hours, click here. The temperature must be higher than 60 degrees for harbor snack bars to open. When nighttime temperatures dip below freezing, restrooms and drinking fountains must be winterized so that pipes don't freeze. Restrooms next to visitor centers and golf course pro shops remain open for public use year-round. The Armleder Trail Connection to Lunken is closed when the Ohio River level is at 38 feet. Otto Armleder Park & Recreation Complex closes when the river level is at 42 feet. See the National Weather Service for current and forecasted river levels. The temperature must be higher than 70 degrees in order for wet playgrounds to open.